We have fitted water saving taps wherever we could and we kindly ask you to turn off all taps when not in use and only use what water you need. Help us reduce the consumption of energy by switching off lights and turning off electrical equipment when not in use. Only boil the water you need when using a kettle. Help us to look after our surroundings by following the Countryside Code, using footpaths responsibly, leaving gates as you find them and avoid littering. Try to avoid overly packaged goods, re use carrier bags, recycle as much as possible, refill your plastic bottle or make an eco brick. Leave the car behind or at least limit the use of it, if only for a day. Our area provides plenty of walking and hiking opportunities nearby. We have created a list for your convenience to help you to choose a fun, car free day out. 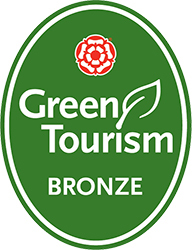 Out To Grass, in conjunction with thousands of businesses and the Green Tourism Business Scheme are working towards reducing hteir carbon footprint. You can help us to tackle environmental issues and to save the planet by following our recommendation lists and support other green businesses.